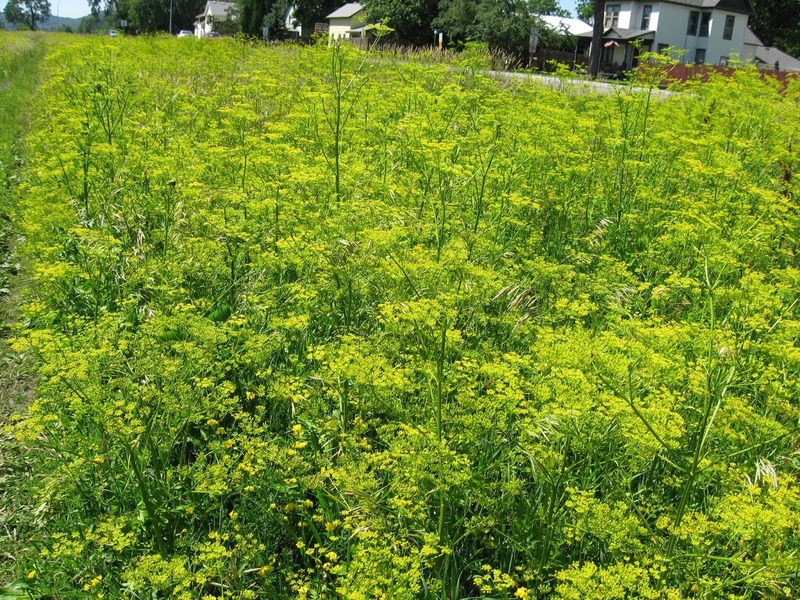 Ramsey County hopes to prevent invasive wild parsnip from becoming established in the county. 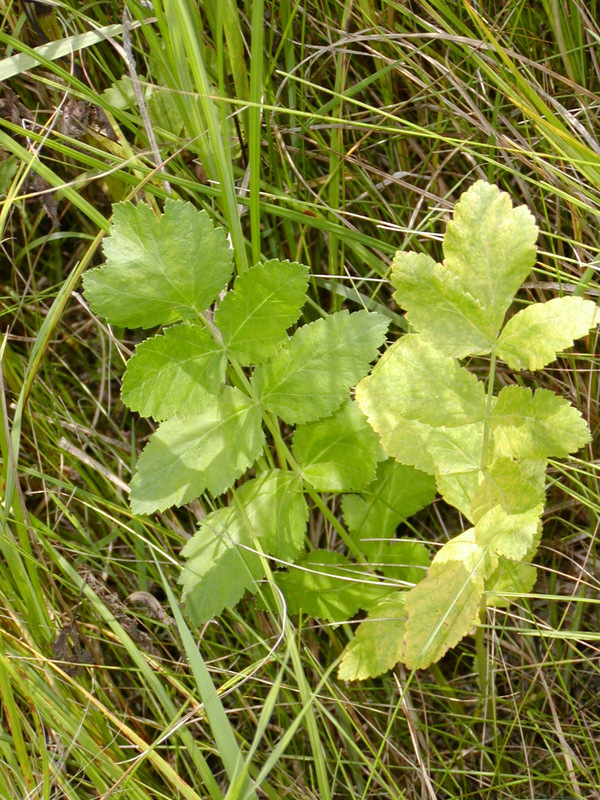 Touching wild parsnip, a Minnesota Noxious Weed, may cause severe skin burns. 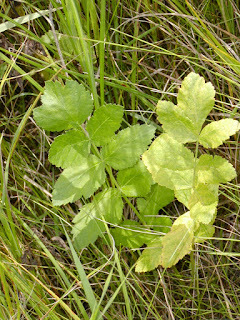 An escaped garden plant, its seeds are spread by sticking to feet, tires and mowers. 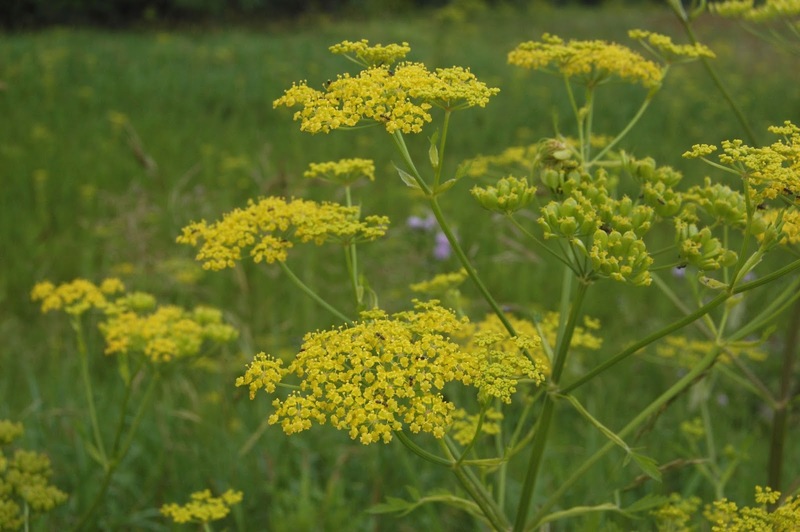 Wild parsnip flowers can often be confused with Golden Alexanders, a beneficial native plant. Golden Alexander leaves have small teeth along the edge and an overall palm-shaped or maple-leaf outline. 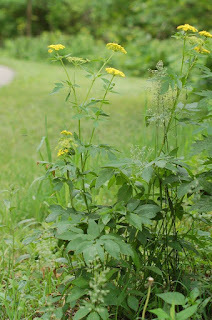 Excellent photos of Golden Alexanders may be found at www.minnesotawildflowers.info. Although parsnip generally starts blooming later than Golden Alexanders, this year there has been some overlap. If you suspect that a plant is parsnip, do not touch it. Please report its location by emailing: carole.gernes@rwmwd.org, or 651-792-7977, giving a good description of its location and how big the patch is. Also take photos if possible. A wild parsnip "burn" four days after contact. Together we can stop this problematic plant from affecting our outdoor activities. Had a friend send this to me. I have this same look on my skin, but I know I have not touched it. It comes on my wrist and the back of my head at the hair line. It only last a few days. I drain it an keep it clean. It dries up an it good. I guess this has happened to my wrist about 3 times. But it came up about once every other month on the back of my head, give or take. Hi Omega; I have learned from an unfortunate experience that it is possible to get the burns from touching tools/equipment that has the dried sap on it as well. Once you get the burn, the area becomes very sensitive to the sun. The sensitivity can last for years, and it increaes your chances of developing melanoma. Make sure to apply high spf sunscreen to the area affected every time you go outside, or cover the area to avoid sun exposure. Recommendations I've seen are not to break the blisters, but you should see a dermatologist for medical advice. There are prescriptions that natural resource managers have told me about that worked; one is called Ultravate. 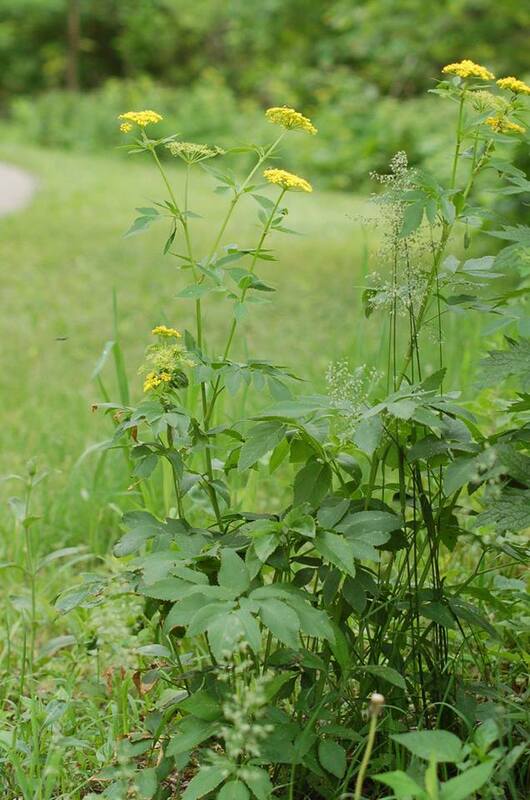 If your encounter with wild parsnip was in Ramsey County MN, please let me know the location. Good luck and be safe out there! Summer Interns Now in Full Swing!